A (relatively) easy way to figure gain or loss when you sell mutual fund shares. This page explains the average basis method for mutual fund shares. You may want to know this so you can perform these calculations in a situation where figures provided by your mutual fund company are not accurate, or simply to have a general understanding of how this method works. Typically this method is easier to use than the separate lot method. Begin by determining what shares are subject to averaging. Averaging for covered shares includes all covered shares of the same mutual fund held in the same account (both short-term and long-term). Generally this means shares purchased after 2011, even if they were purchased as a result of reinvesting a dividend on noncovered shares. Averaging for noncovered shares includes all noncovered shares of the same mutual fund held in the same account. Generally this means shares purchased before 2012, although shares acquired later can be noncovered shares in some circumstances. Maintain a running total of the total basis of all shares subject to averaging. Each purchase of shares in that category, including a dividend reinvestment purchase, adds to the total basis. Make any other necessary adjustments, such as for wash sales or nondividend distributions. 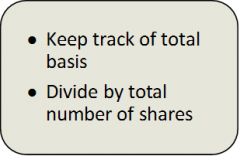 When you sell shares, divide the total basis by the total number of shares to get the basis per share. Multiply this figure by the number of shares sold to determine basis for this sale. Also, be sure to subtract this number from the total basis you’re tracking, so you can accurately determine the basis for your next sale of shares. In Using the Separate Lot Method we presented an example where you made four monthly purchases of $1,000 each, and also received a $60 distribution (which was reinvested), with $40 of that amount being a dividend and $20 being a nondividend distribution. basis calculations were somewhat complicated, but when we use the average basis method we simply need to track the total. That’s $4,000 for the cash purchases plus $60 for the shares purchased by reinvesting the dividend, minus $20 for the nondividend distribution, which comes to $4,040. Then we said you sold 84.773 shares. To find the basis for this sale, divide $4,040 by the total number of shares (which was 157.849) and multiply by 84.773, to get $2,170. That’s a lot easier than the process we used to find the basis using the separate lot method. Remember to reduce your total basis ($4,040) by the basis recovered in this sale ($2,170) to arrive at $1,870, the basis of the remaining shares. The description so far makes it seem as if you don’t have to track individual lots when using the average basis method, but that isn’t quite true. You still need to know whether the shares you sold had a short-term or long-term holding period. You also need to know the purchase dates for recently purchased lots when you apply the wash sale rule and some special rules for mutual fund shares. The average basis method doesn’t eliminate all the recordkeeping headaches associated with holding multiple lots of mutual fund shares, but it makes the basis calculations much simpler.